Do you remember road trips back in the day? Back when you would load up in the car, way too much stuff in the back, and you would prepare for several hours straight of travelling far while moving little. You weren’t allowed to drink water for 3 days beforehand to make sure you made as few pit stops as possible. Of course, maybe your parents tried a different technique and just put you in a diaper. Some people mastered the art of sleeping the entire time (head bobbing optional), but I was a little too hyperactive to develop that skill. I also couldn’t read too much because I would be carsick if I even cracked the cover of a book. Thus, I was left to finding ways to entertain myself on long stretches of empty road. My favorite was spotting the letters of the alphabet on billboards. Fun in certain places, but way too long when you’re driving in the middle of nowhere. There’s “I’m going to California” or whatever your version, where you have to memorize the list of items you’re taking in alphabetical order. As I got older, we also played a movie connection game, where we would name an actor, another person would have to name a movie that person was in, and then the next person would have to name a different actor from that movie, etc. With the introduction of in-car TVs, iPads, smartphones, and more, many kids have found different ways to keep themselves occupied. However, that car sickness issue is still a bit of a problem with all this new technology, but I’m here to provide some suggestions other than those old classics. Here are a few games that I think could work as alternatives. I’m picturing one or two rows of back seats, with not all that much room. You may need to make a few little adjustments to the way you play, but it’s still probably better than staring at the same screen for 5 straight hours. You know, when we work on this blog, we often are looking for new gaming experiences that are unlike anything we’ve played before. My collection is constantly changing as I’m trying to find different card and board games that will lead to special moments with my gaming friends. However, in all that hubbub, we can sometimes cast aside classics, thinking of them as outdated or irrelevant. 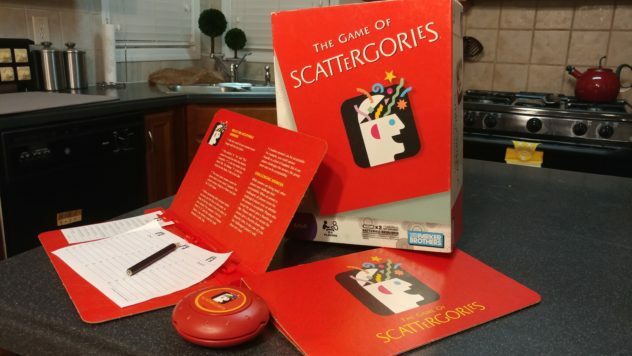 So, I want to remind us all of Scattergories, a game that is almost 30 years old. In case you’ve lived like Kimmy Schmidt during that time, it’s a pretty basic word game: you have a list of categories, and you have to come up with a word for each of them that all start with an assigned letter. You get points for answers that no one else has, and the person with the most points after three rounds wins. While this won’t work very well for those who get carsick, it’s a great option otherwise. You only need to be able to roll the letter die and use a timer. The rest of the writing can take place in each player’s lap. It’s also a game that works well for a few rounds, so it could hold your attention for an hour or two. 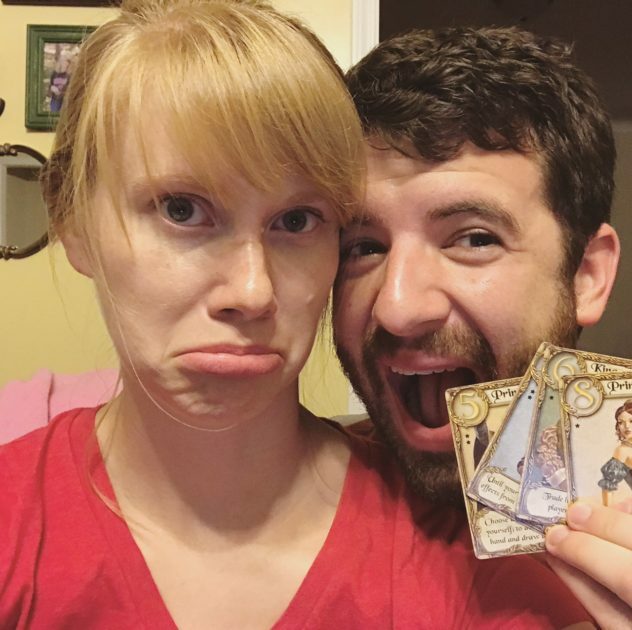 Hanabi is a game that can be a little bit hard to wrap your mind around because of one significant rule change. Instead of holding your cards so that you can see them, your cards are held face out, so that everyone BUT you can see them. Play revolves around you providing hints to your fellow players and remembering the hints that they give you so that, together, you can play cards in order for each color. It’s a fun little twist and it makes for a good game. You would need an empty seat or some other space in which to put down the cards, and you might need to make some adjustments to how you use the clues tokens. But otherwise, all you need are your hands! This is the only cooperative game on this list, so this can help to prevent unnecessary animosity for the hours ahead of you. Love Letter lies in the category of ‘microgames’ – those that contain relatively few cards and pieces. Love Letter, in particular, only involves 16 cards, and you only hold two cards at most at a time. Each round only lasts a few minutes, with players trying to have the highest card at the end of the round or to eliminate all the other players from contention. The cards and that basic rule description do not do this game justice – it really is fantastic. Plus, it’s super cheap! Given how few cards there are, you’ll really just need a place for discarding. This could be an empty middle seat, or even just laps. Plus, this game is one that works well for just two people, so you won’t need to bring the crowd with you. I think you can leave out the round winner cubes, as they’re 100% guaranteed to end up all over the car, never to be found again (except maybe by a vacuum). Another oldie but goodie. Many of us have played this game before, which acts like hot potato with words. Players get into teams, start the timer, and begin immediately spurting out words, trying to get their teammates to guess the word on the screen. Once they get it right, the device is passed to a player on the other team, who does the same. If the timer goes off while it’s your turn, the other team gets a point. This is another circumstance where I don’t want you to pass it up simply because it’s been around for a while. 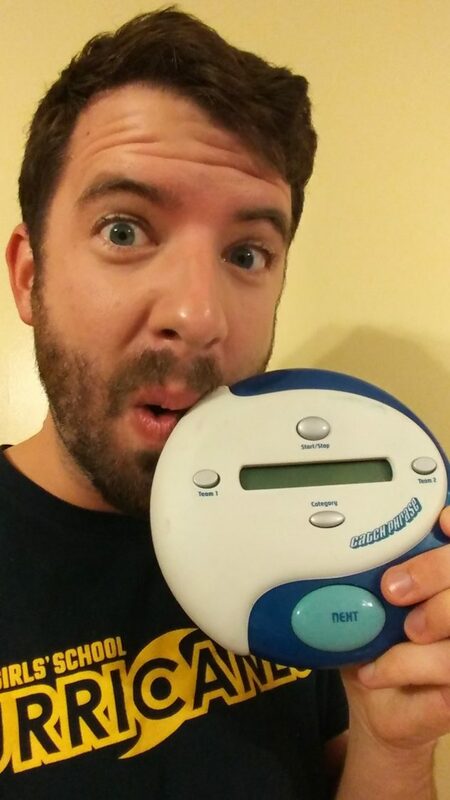 I mean, you can play the whole game with a little circular plastic thing! It’s easy to pass from seat to seat, and you really just need 4 players to be able to pull it off. Of course, you could play team style and have one clue giver, seeing how many you can get through before the timer goes off. The one warning: this will quickly test the patience of the driver. That incessant beeping and booping may lead them to ‘accidentally’ throw it in the garbage at the next rest area. Were there any games that you play that we might have missed? Let us know in the comments below!